The theme of this issue is that layouts can be built with the help of others. Gerry Albers describes building and operating his District of Virginia Railway (HO-scale). It fits in a 49'x38' room, with under-the-layout hidden staging. The layout is set in 1959. Includes a side-bar on hidden staging. See Gerry's web site for more about the layout. 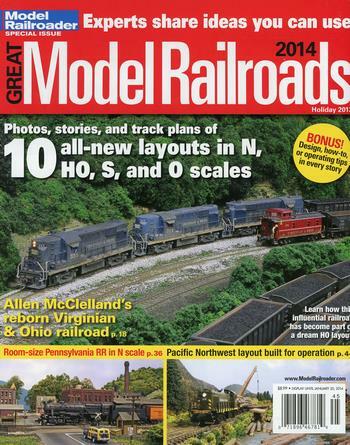 Allen McClelland describes how Gerry Albers (see page 8) has allocated a section of his layout to be the V&O, and allows Allen to decide how the area is modeled and run. This allows Allen to have his layout, without having to build one. Paul Dolkos writes about how the Aiken, South Carolina Visitors Center wound up with an HO-scale diorama of the town in 1916. Includes a side-bar on using enclosed dioramas, and using laser cutters to make unique models. Dave Vollmer describes how and why he built his N-scale PRR Juniata Division on two interior house doors. Includes a side-bar on how he implemented PRR signalling. Mat Thompson describes how he got involved in operating a layout, and uses his 32'x54' HO-scale layout, set in 1953, as his example. Includes a side-bar on self-staging, one about briefing his crew before the operating session, and another one about how he redesigned an industry to offer more operating interest. Chuck Hitchcock writes about how Mike McLain build an MKT 26'x56' HO-scale layout, set in 1981. Includes a side-bar on how the group involved with Mike's layout visited a real cement factory to be able to study the prototype. Paul Dolkos writes about how Art Fahie and a few of his friends designed and built a Sn2 layout that is in the Bar Mills office. The layout, "Warf Street" (follow link to see Art's web page about the layout), measures 6'x17'. It was built in 2007 for the National Narrow Gauge Convention held in Portland, Maine that year. Includes a side-bar on gauges (narrow and wide), and one on how Art designed the layout's lighting. See a quick video of the layout on YouTube. Paul Dolkos writes about Wayne Sitter's 9'x41' HO-scale layout. Includes a side-bar on weathering, and another one on backdrop painting (Wayne is a professional painter). John Short's HOn3 layout measures 13'x22' and is set in southwestern Colorado in 1948. Includes a side-bar on how to add stagging to an existing layout, and another one on using accessory decoders to control turnouts. Jim Eudaly describes his 35'x50' O-scale layout modeling the Chesapeake & Ohio on three levels. Includes a side-bar on the realities of building your layout in a separate building on your property.